The Twisted hunt is now over, and the A&A celebration will be soon as well. 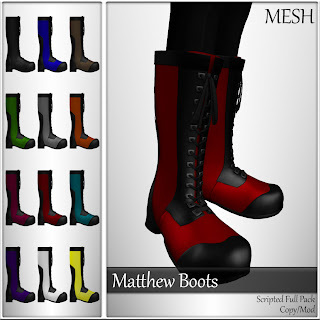 So, as I have promised to several people who asked, I have released the solid texture versions of the Saula heels and the Matilda and Matthew boots! There is only one big difference with this release, than previous releases....By popular demand, I have decided to sell single colors again. So I have changed the layout of the vendors just a little bit. To grab a demo, left click on the large panel, and choose "get demo". To purchase the full scripted pack, left click the large panel, and choose the "cash" or "storecredit" option. 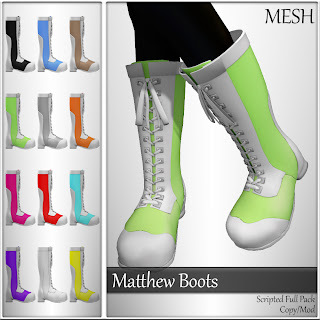 To only purchase one color, left click the color you want in the left panel, and choose the "cash" or "storecredit" option.